When was the last time you didn’t want to pick up coffee on the way to work? Can you remember the last weekend morning when you didn’t think it would be best to sit at a coffee place instead of in your kitchen? The coffee at your house isn’t that good. Face it! And to add salt to your wound, you’ve got co-workers who are always bragging about the awesome coffee at their house. Those people tend to create a mystique around their coffee habits, don’t they? Well, everyone can make great coffee, with just a few things to know, including what the best coffee bean grinder is for your individual needs. Pretty much every coffee drinker, particularly those who identify as coffee enthusiasts knows the rules of home coffee brewing, right? For the best tasting coffee, grind your own beans! To make it really great, you’ll need the very best espresso grinder. If you want the best coffee, you’ll need the best coffee grinder to grind the best coffee beans every day right in your own kitchen. This quick, handy guide will explain it all and leave you feeling like an expert. Hold on. 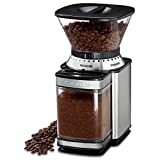 Before talk about the best coffee bean grinders, shouldn’t we talk about what a coffee grinder is? Do you know? You’ve got your blade coffee grinders and your burr coffee grinders. The blade grinders are just that: they chop up the coffee beans with blades, like what you’ve got going on in your home blender. Blade coffee grinders are most likely electric and make a crazy amount of racket when they’re working. And, unlike a burr coffee grinder, they’re not exactly grinding the coffee, just chopping it up. The only component of control you have is determining how long you hold down the button. With a blade coffee grinder, you don’t get to choose how fine the grounds will be, only how long you chop them. Burr coffee grinders really do grind the beans. You know those funny, ancient coffee bean grinders made of wood with a black cast iron crank on the top and that cool drawer on the bottom? Those are burr grinders. Burr grinders work by mashing the coffee beans between two revolving discs that look a little like gears. They can be manual or electric. And guess what? With the best burr coffee grinder, you can actually choose how fine the grounds will be… there are settings. However, not all burr grinders are created equal. What’s the best burr coffee grinder? We’ll investigate in just a moment, because, hey, maybe you like blade grinders and want to think about them for a minute longer. What’s the Better Grinder, Blade or Burr? Who’s to say which kind of grinder is best? It’s up to you. I lean toward the burr variety because the grinding action creates a more consistent batch of coffee grounds and I like to choose how fine the resulting grounds are. Then again, people who grind their coffee every day seem to like how fast an electric blade grinder is. But it’s noisy and seems a little violent, right? No one can tell you which best coffee bean grinder is best for your coffee needs. I can, however, tell you what the best grinders on the market are, then you can take it from there. The Capresso 560.04 Infinity Conical Burr Grinder is one of the best coffee grinders. Jura-Capresso, is definitely a higher end brand of grinding products. They pride themselves on achieving some of the finest grinds primarily used for the best espressos on the market today. Since this is one of the most expensive brands on our list today, we want to make sure it comes with additional features that will justify its higher price point. The Capresso 560.04 Infinity Conical Burr Grinder uses a 100 watt motor to achieve a high powerful grind. It comes with 16 pre-programmed grinding settings to allow you to choose what type of coffee you are going to get. It is made out of durable ABS Plastic, destined to last a long time. The conical burrs on the product are commercial grade and ensures the highest flavour of coffee. The container can hold 8 ½ ounces of beans, and the grinding container can hold 4 ounces. The conical burr on the upper level is easy to remove so you can clean easily. It comes with a 1 year warranty. Rancilio coffee equipment is top of the line; it just doesn’t get much better. We might even say this is the best burr coffee grinder. Rancilio coffee makers are so good that if you don’t use a Rancilio grinder to create the perfect grounds, you can’t get the full experience. You’ll pay between $300 and $800 for one of these grinders, but it’s worth every penny. The Baratza encore grinder isn’t as high-end as the Rancilio. It’s costs less, between about $120 and $150. You can still expect a really great ground from it. It’s a quality grinder for beginners or people who just want their beans ground without a lot of frills. The B006MLQHRG is similar to the Encore, but it has a 60-second timer. 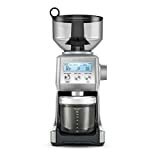 The Cuisinart DBM-8 is a bestseller on Amazon. It’s simple and affordable at about $50. Cuisinart is a classic brand in home cooking, made famous largely by Julia Childs. Its entry into the world of coffee has not disappointed. The Breville BCG820BSSXL retails for around $200 and is features-heavy. It minimizes heat on the beans by use of conical burrs rather than the flat disc burrs. The KRUPS F203 Electric Spice and Coffee Grinder is one of the electric coffee grinders available both online and in store. KRUPS is a reliable brand that is well known around the world. They make high quality products that work, but are also extremely affordable. This specific grinder is no exception as it is definitely the best budget coffee grinder one on our list today. Whenever looking at a product that is at a cheaper price point, we want to make sure it still has features that will enhance your grinding experience. As well, we want to make sure the manufacturer did not use cheap materials that will break down on you, just to have it at a lower price point. The KRUPS Electric Spice and Coffee Grinder is equipped with a 200 watt motor that will grind down your coffee beans and any spices that you desire. The motor is powerful enough to grind up to 3 ounces of coffee beans in just a matter of seconds, ensuring that you can get on with your day without waiting around for it. The KRUPS Coffee Grinder blades are made out of stainless steel, ensuring that grinding will be uniform and cut all the way through. It has a pretty large capacity and can actually grind up to 12 cups of coffee at one time. The lid has a safety switch, ensuring little ones around the house will be safe. It comes with a 2 year warranty in case anything goes wrong. The grinding time is customizable depending if you want a fine espresso grind or a coarse thick Turkish coffee type of grind. The machine is an oval design. Not only is this a coffee grinder, but it is meant for herbs, nuts, grains, whatever you need grinded down finely. If you are looking for the best coffee grinder, all of the choices above are definitely worth looking into. They are customizable and will provide you with choices to have the most delicious coffee in the morning. Q: How do I clean my burr coffee grinder? A: Since you’re a big fan of a great cup of coffee, you’ve certainly seen over and over that you’ve got to have clean equipment in order to get the best brew. You likely already know to wash your French press every day and use only the best-filtered water. Same thing goes with your coffee grinder. Even if you have the best burr coffee grinder, the coffee beans are oily and leave their special coffee oils behind, especially on the equipment that’s ground them. Most likely your grinder has adequate cleaning instructions, but the basic thing to know is that you should use a soft brush or soft cloth and wipe it clean without water. If you’re using a brush or cloth, remember to unplug the grinder first. Lightly stroke the area that comes into the most contact with the beans. The rice method. Some people like to send rice through their coffee grinder in order to clean it. This works pretty well, except for two things: rice can be harder than coffee beans and stress your motor; rice is starchy and can leave a residue. Many consumers swear by products meant for cleaning grinders. There’s not harm in going with one of those as long as it’s approved by your manufacturer. Q: How do I figure out my coarseness setting–I have 60 to choose from!? A: That’s a tricky question to answer. The best coffee bean grinder will give you anywhere from 10-80 settings. You’ll have to experiment using the following basic knowledge (or carefully read your manual for suggestions). Generally speaking, you’ll want the finest grounds possible if you’re making espresso in an espresso maker. If you’re making espresso without a machine, it should be just one step less fine. Drip coffee makers with cone filters need the next level of coarseness, so medium-fine. Drip coffee makers with the flat-bottomed filters call for a slightly coarser version of this. The coarsest grounds are for French presses or cold brews. So, finest for espresso, coarsest for French presses and cold brews. Q: Is there any point in getting a manual coffee grinder? A: Yes, a lot of people prefer the best manual coffee grinders. In fact, for some, the manual is the best burr coffee grinder option there is. For starters, a manual coffee grinder is much less expensive, you can get one for anywhere from about $8 to $120. Do you have a baby who’s trying to nap during your coffee time? Or are you living with someone who works opposite hours from you, yet you’ve still got to have your fresh-ground beans every day? You’ll want something as quiet as possible, right? A manual burr coffee grinder is the ticket. You also know that you don’t ever want your beans to get hot. A lot of electric grinders have various methods of keeping their motors from heating the beans, but you can bet that a manual grinder is going to keep your beans much cooler than anything electric. You can take a manual grinder camping. Maybe you don’t camp much… So, think of those times when your power goes out and you really wish you could have a cup o’ joe. Perfect. A manual grinder doesn’t need electricity, let’s just hope you have a gas stove to go with it. As far as the quality of the grounds–no, there’s no benefit to a manual over an electric (except the part about not heating the beans at all). Q: How long will my burr coffee grinder last before I have to replace it? A: As with any appliance, how often you’ll have to replace it largely depends on how often you use it and how well you care for it. Most grinders come with a 1-year warranty, but the best ones should last years before needing to be replaced. Even the best burr coffee grinder will eventually need to be replaced. Q: Are the blades replaceable? A: Yes. And you should pay close attention to your burrs. Every time you grind, you dull your blades just a little bit. When to change the burrs are up to the manufacturer. Most manufacturers measure the replacement time in “throughput.” By throughput, they mean how many pounds of coffee you’ve sent through your coffee grinder. Warning, while it’s not common, it is possible for foreign objects to be in your coffee beans–things like tiny sticks or pebbles. If one of those enters your grinder it’ll dull your blades prematurely. Just like when you’re cooking rice, look through your beans for anything that does not belong. If you’re not sure what your throughput is, sight-check your consistency. Is your fine ground all fine, or do you have some coarser grounds mixed in? Also, feel the edges of your burrs–are they noticeably dull? Does your coffee taste as good as when you first bought the grinder? If you’ve answered yes to any of the above questions, replace your burrs. You’re a little closer to a fresh, steaming cup of coffee that tastes like a pro made it… right in your own kitchen. 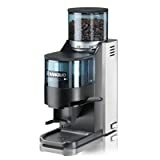 Nothing’s holding you back now but deciding which is the best coffee bean grinder for your personal needs. What’s your favorite espresso grinder? Tell us in the comments below.